In Tobacciana > Meerschaum Pipes > Show & Tell. 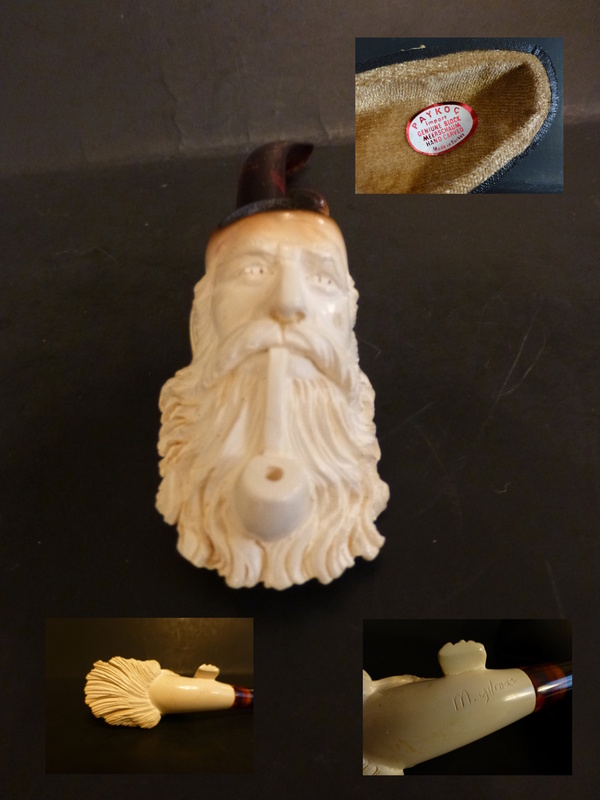 I finally located my small meerschaum pipe that has been missing for the past decade and a half, or so. I did not recall that it was signed and was very pleased to discover that it is the work of a well known Turkish meerschaum carver, Muharrem Yilmaz. I dug deeper into a closet where I keep my cigar humidor, now just a storage box for my pipe collection, since I haven't smoked in about 15 years. I noticed an empty box of what was my favorite cigar of all time. This cigar has not been made since the late 1990s so I nursed this box of 25 torpedo cigars for several years before smoking the last one (HUGE sigh). It was easy to quit once the last one was gone. Anyway, I pulled that box out and inside I found this pipe, a very nice Italian made, silver chased Whitehall pipe and all the gear needed to smoke on a road trip, including a pouch of very dry organic tobacco. I guess I must have taken them on one of my genealogy road trips and instead of putting them back in my humidor, just tucked them away in the closet. Very good day as I have been missing this pipe very acutely. I did not remember owning the Whitehall pipe, so that was a bonus. It is a big pipe, probably a ten-fifteen minute smoke. The meerschaum is about 5 minute smoke. It is 3" long x 1 .5" x 1 .5", without the stem. Yilmaz Meerschaum was established in 1973 by Muharrem YILMAZ . His teacher was his uncle. He started carving at the age of 16 and he loves his profession of making quality Meerschaum pipes. Though a skilled carver himself, he also employs some of the very famous carvers in in the business. His pipes are composed of sophisticated designs that include faces, animals, and geometric designs The Yilmaz name represents top quality in Meerschaum pipes today. Is that the orig. amber stem ? It is the original stem, blunderbuss2. Thanks for loving my rediscovered pipe! Love the story, love the pipe. Thanks for posting it. @truthordare - YW, thanks for the comment! Thanks for loving my long lost pipe! Thanks for loving my meerschaum pipe, Hunter! 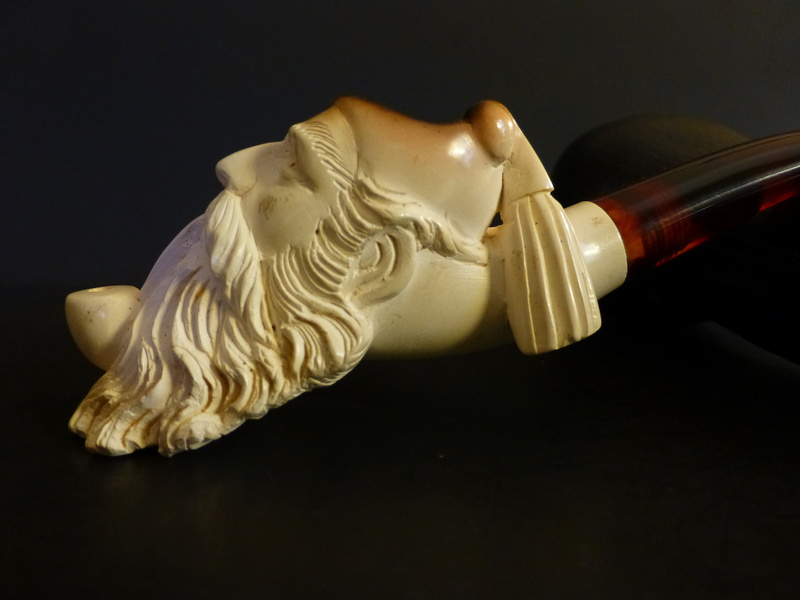 All of a sudden meerschaum has become scarce and more expensive. Not sure if this is a market blip or what. 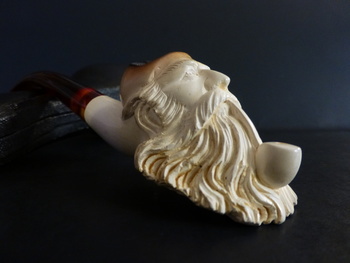 Makers are now making pipes out of ground up meerschaum scraps joined to together with some sort of bonding agent and forced into molds to look like carved meerschaum. Buyer beware! I've read up on this a bit and it is not a new process, but it appears to be more widespread currently. Pipes made this way supposedly retain the smoking characteristics of carved block meerschaum. I bought one out of curiosity and it looks fine, but I no longer smoke so can't report on that. They are very inexpensive. There is also suddenly a lot of Chinese meerschaum out there, too. Thanks for the warning. Beware of anything coming from Poland(especially) & other E. Euro States. Even Americans who have been "stuck" with their crap are trying to pass on the crap instead of just accepting that they got screwed. I collect a lot of WWII Nazi items & just found out several yrs. ago that Solingen dress dagger manufactures continued making these "collector's" items at the end of the War to sell to GI's as souvenirs. That came as a blow to my imagined expertise ! 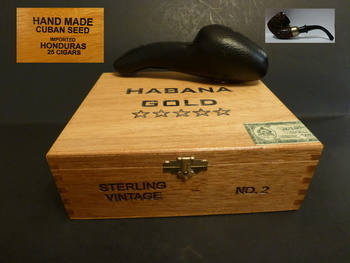 Made by the original manufactures, - so how do you tell ? Where there is value, there are thieves ! Quality is the other problem. Fakes are more & more fooling the experts to the point where prices are dropping because people are justly wary of buying. Of course you still have the clummsies who market U-boat watches etc. with English wording & items purported to be early Nazi with RZM markings when Rzm didn't didn't exist until 1934. If they were all that stupid, it might be laughable.